During Phase 1 which ran from April – July 2018, we focused on gathering peoples’ views. We wanted to know what you value, what you would like to see in the area and what you wouldn’t like to see in the area. During this phase we put together our People’s Panel and the panel provided a statement based on the feedback received throughout the consultation process. During Phase 2 we will bring back to the community some ideas based upon the feedback received, so that the community can see what we are thinking and provide us further feedback. During Phase 3 we will bring our proposal back to the community for further comment before we lodge any planning documents. After this, we are aiming to submit a Development Application. This will not be the end of the conversation though. We will continue to consult and work with the community as the project continues. This is a 10 year project. During Phase 3, we will be lodging an application to vary the Territory Plan to change the use of the land from a golf course – this is a first step in creating the future we collectively imagine. re:imagine is a conversation with the community about the future of an important part of Gold Creek. 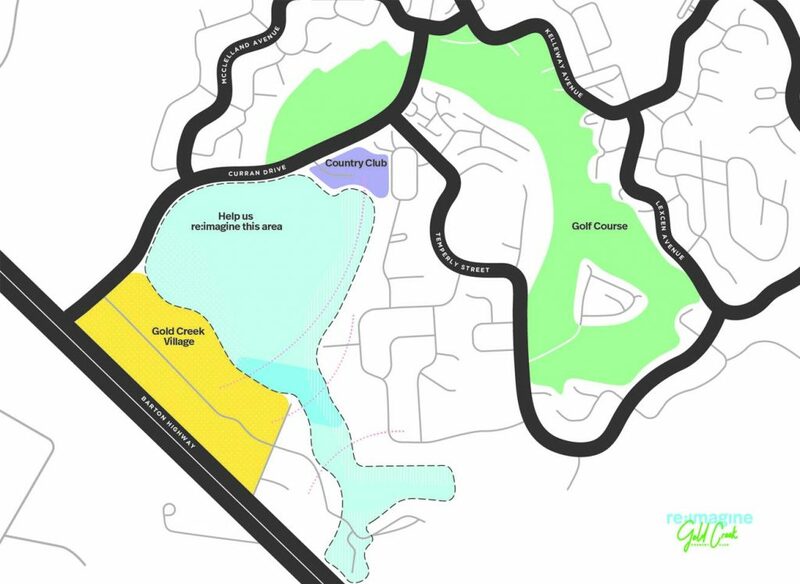 Part of the Gold Creek Country Club will no longer be required by the golf club and the re:imagine project provided an opportunity to gather community feedback on creating something new in this space. We sought to find out what our neighbours and broader community would like to see on the site. We want to build a community, but to build a community we need to understand our community aspirations. Phase 1 of the conversations took place from April – July 2018. During this time we spoke with and listened to our community in a variety of ways and in a range of forums. We hosted community events, ran surveys, created a People’s Panel and a range of other activities which enabled people to have their say. We now have a lot of feedback to go through and will return to the community before taking any next steps. What will you do with what you find out? During Phase 1, we collected statistical data through surveys and a broad range of qualitative information. This information will be used to inform decisions around the future options for the site. The information was also considered by the People’s Panel and incorporated into their final statement. Phase 1 of the consultation process ran from April – July 2018. The owners are now considering all the feedback received and will come back to the community before taking any next steps. Where is this project happening? Why a compact golf course? A compact golf course is a shorter 18 hole course; but could also potentially be a 9 or 12 hole course. It uses innovative design to create a course that takes less time to play, requires less land and therefore less water, chemicals and upkeep. The Gold Creek Golf Course is one of the longest courses in the ACT. The course currently covers approximately 88 hectares (ha). Comparatively, Yowani Golf Course is 47ha, Gungahlin Lakes is 53 ha and Federal 58ha. The Gold Creek Country Clubs believes that a shorter course (most likely in the range of 40-50 ha) will attract more players to the game, increasing the overall use of the course and will make the course more sustainable and viable in the future. In terms of operations, a shorter course (from 88 ha down to 50ha for example) would save the course approximately $200,000 per year in operational costs. How many members does the gold club currently have? There are currently 330 members of the golf club. What commitments were given by the KGroup as part of the purchase of the gold club? Have the commitments been met? The Gold Creek Country Club was purchased by the KGroup in 2006 for $3.3M after a competitive tender process was conducted by the ACT Government. The sale contract did not require the new owners to spend a minimum amount of funds on the golf course. The sale contract did include 15,000 square metres of development rights on the site. At the time of purchasing the site, the KGroup anticipated it would invest between $10 and $12M on the development of the 15,000m2. To date $6M has been spent developing the gym, childcare centre and indoor kids play centre. A further $1M has been spent on works and preliminaries for an indoor cricket centre and relocated maintenance facilities. However, the development conditions imposed and the additional time it took to seek approval from ACTPLA made these propositions unviable to continue with. More than $300,000 has also been spent on increasing the water licence for the course and associated water infrastructure. Since 2006 over $8M has been spent on subsidising operational costs (approximately $500,000 to $600,000 per year) to ensure the Golf Course continues to operate. What are the current lease requirements of the Gold Creek Country Club with respect to the requirements for a golf course? The Crown Lease is publicly available through Access Canberra. Have any applications been submitted to change the current zoning or lease purpose of the site as part of the re:imaging project? No, nothing has been submitted to the planning authority. Any required changes to the zoning or lease purpose clause of the site will depend upon the outcomes of the community consultation as this will inform what will be proposed for the site. Has the ACT Government indicated support for the proposal? The ACT Government has not been approached to provide advice or feedback on the site or the associated community consultation program. The ACT Government was advised on the commencement of the community consultation program and provided with the same information that has been distributed to the community. Re:Imagine Gold Creek Country Club has a genuine and strong desire to approach the ACT Government with the ideas and feedback of the community. Does the KGroup already have plans for the site? No plans have been developed for the site and nothing has been lodged with any planning authorities. What about the kangaroos that live on the site? The Gold Creek Country Club has managed to live cooperatively with the kangaroos and other wildlife since it was established. We will seek to work with ecologists and the local community to understand the potential impacts of any landuse changes on the existing wildlife and identify ways that minimise the impact. Any changes to the use of the site would also be subject to environmental assessments as part of the approvals process. What will the KGroup do if the community says they don't want and development at all? The KGroup is hopeful of identifying opportunities for the site that are of benefit to the broader community and that enhance the Gold Creek area for all residents. These opportunities are likely to arise from making better use of excess and vacant spaces around the golf course for other community focused needs. Community support is integral to ensuring that decisions around the use of additional space will meet the needs of our residents. Without that support, any proposals for future development are likely to be unviable. What impact will the development have on property values in Nicholls? The re:imagine project seeks to improve the Gold Creek area for all residents. Any development that would negatively impact on property values in Nicholls does not meet this important objective. Even though there are currently no plans for the site, it is imagined that Gold Creek will always remain an area where residents enjoy open spaces and golf course living. The re:imagine project is about working with the community to improve on that ideal by identifying opportunities for other uses that are in the broader community interest. If we work together in that process, land values in Nicholls will be positively impacted, as it becomes a space that can be utilised and enjoyed by the community as a whole. Is the chair of the People's Panel being paid? Yes, Amanda Whitley, as chair of the People’s Panel is being paid for her time as a facilitator. As a facilitator, Amanda is tasked with ensuring all participants are given a fair and balanced opportunity to present their views. Amanda is not focused on a specific outcome. While she will facilitate the decision-making process of the panel, she is not a stakeholder in the final outcome. Because this community consultation is at such an early stage in the project, we required an expert facilitator with the skills to chair a large meeting representing a range of views, so it was appropriate to engage a professional.